All healthy babies can begin to feed themselves from about six months. They just need to be given the opportunity. 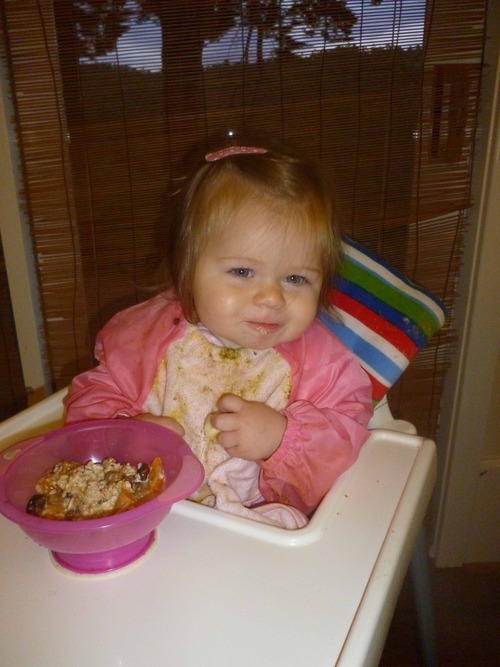 My journey with Baby-Led Weaning started after I had introduced Isabelle to food using purees at about 6 months. 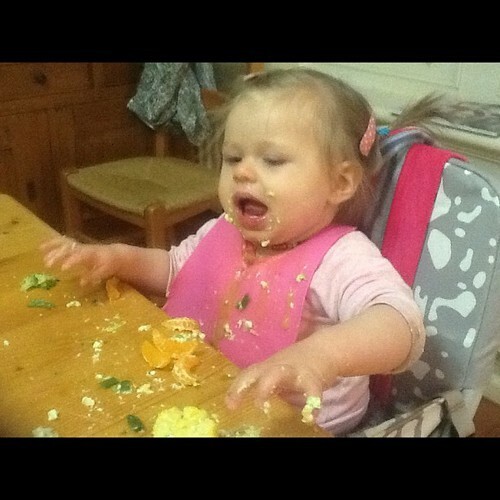 I then discovered Baby-Led Weaning when Isabelle was about 7 months, and there was no turning back. It seems when I allow Isabelle to do things herself including feeding herself she jumps at the opportunities to learn. So what is Baby-led Weaning? 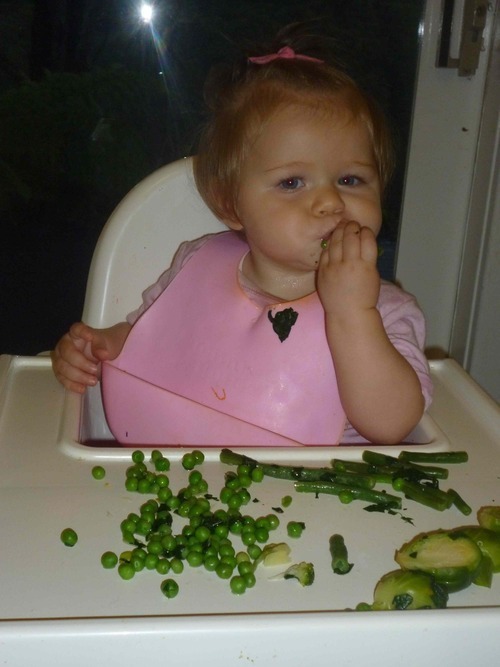 Baby Led Weaning, quite simply, means letting your child feed themselves! Baby-led weaning is a way of introducing solid foods that allows babies to feed themselves – there’s no spoon feeding and no purées. 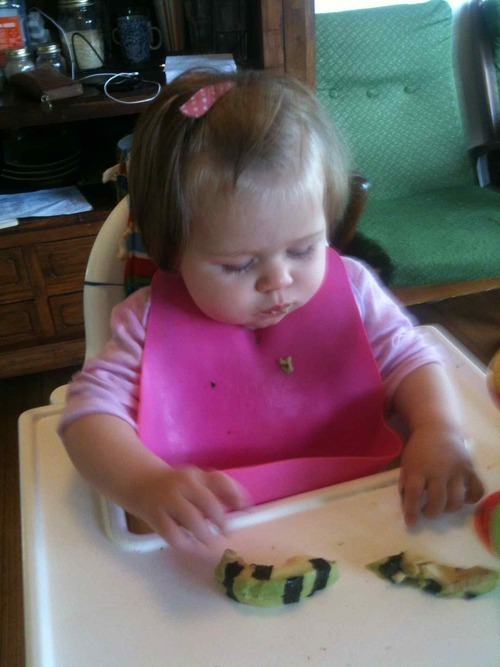 Baby-Led Weaning is just you and your child, eating food that you enjoy with you and your family. 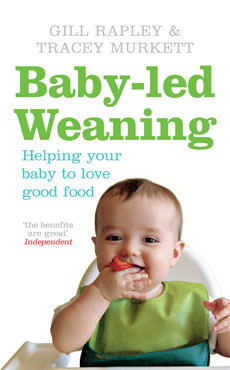 So what are the benefits of Baby-led weaning? Sit your baby upright, facing the table, either on your lap or in a highchair. Make sure she is steady and can use her hands and arms freely. Offer your baby food, rather than give it to her – put it in front of her, or let her take it from your hand, so that the decision is hers. Start with foods that are easy to pick up – thick sticks or long strips are best at first. Introduce new shapes and textures gradually so that your baby can work out how to handle them. Include your baby in your mealtimes whenever you can. As far as possible – as long as it’s suitable – offer your baby the same food as you are eating, so that she can copy you. Choose times when your baby is not tired or hungry, so she can concentrate. Mealtimes at this stage are for play and learning – she will still be getting all her nourishment from her milk feeds. Carry on offering breast feeds as before – this is still your baby’s main source of nutrition until she is a year old. When your baby needs less she will reduce feeds herself. Offer your baby water with her meals so she can drink if she needs to. * Don’t hurry your baby or distract her while she is handling food -allow her to concentrate and take her time. Don’t put food into your baby’s mouth for her or try to persuade her to eat more than she wants. When I transitioned over from feeding Isabelle I did offer her some food, as she continued to get the hang of feeding herself about a month after she no longer allows me to put food near her mouth! Provided simple safety rules are observed, choking is no more likely than with any other method of introducing solids. 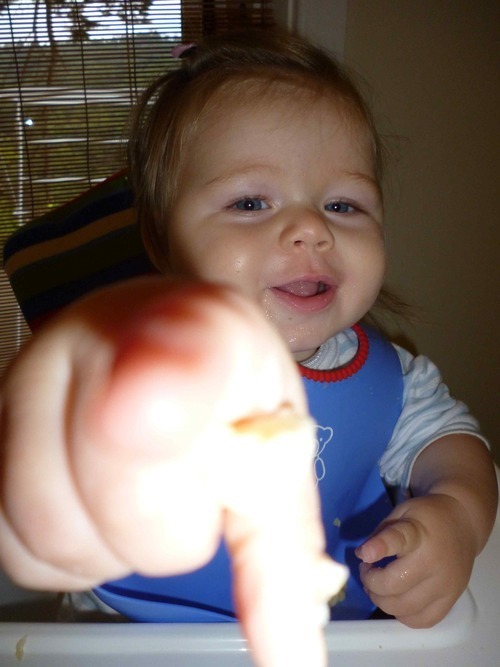 In fact, allowing babies to control what goes into their mouths may actually help them learn to eat safely. Sometimes Isabelle will choke on her food but learning how to use her reflexes she is easily able to spit the food back up! I always offer her water if she has had a little choke, but now she is a little expert at feeding her self she hardly chokes anymore! By Gill Rapleyand Tracey Murkett – This a great book to check out! 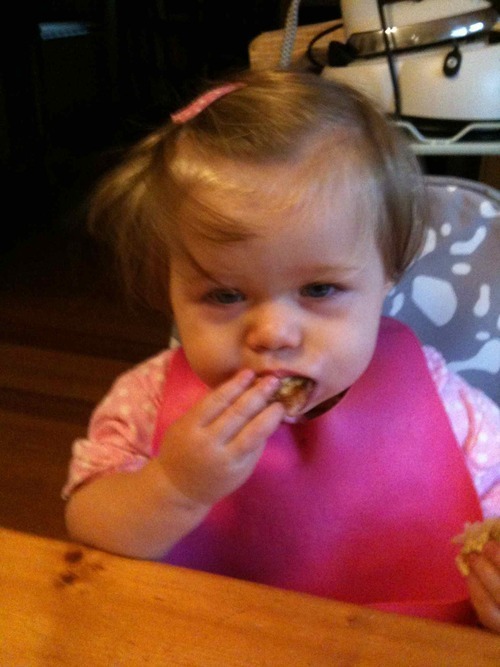 I have included some pictures of Isabelle’s Journey with feeding herself! Look at the joy on that little face! Yummm dinner time! I got this idea from Shazzies Book! Strips of Advocado with Seawead strips! Issy loved it! It also made for handling the advocado a little easier. This is Isabelles impersonation of Matt Monach at the Raw Food World TV show! If you watch the You Tube Shows you’ll get it!